The drive down from Minneapolis was long but uneventful – a little fog in Wisconsin – until we got to the outskirts of Chicago on I-90. I became confused and took the wrong branch (despite my Garmin saying stay right, I went left) and so instead of the shorter Kennedy route, we ended up on the Eisenhower and nearly went on into Indiana! So we were very late getting to the Art Institute of Chicago, where we were met by Victoria Frank, who is one of the co-autocrats running the ANG event. We went almost at a trot through the Institute’s amazing – astonishing – collection of Impressionist art. I’ve often seen these paintings on postcards, calendars, as illustrations in books and essays and on line. Today, we stood right in front of them. Some of these paintings are HUGE; such as Caillebotte’s Paris Street: Rainy Day. Tanya and I have promised ourselves and each other that we are coming back to Chicago to spend at least a day walking the galleries. Victoria rode with us to our Marriott Hotel on the Magnificent Mile. I had to give every one of my various names before they found us at check-in. Not Mary Kuhfeld, not Monica Ferris, but Mary Monica Pulver. We checked in a second time on the seventh floor where the American Needlepoint Guild had set up shop, then so long as we were there, went into the room where a needlepoint shop had brought lots and lots and LOTS of canvases. My fingers itched to haul out my credit card and buy this one and that one and another one. But we’re going to England in March, so I managed to grit my teeth and not go into my wallet. We went out for a late supper at a bar and grill kitty-corner from the hotel. There was too long a wait for a table so we sat at the bar. I had a bloody Mary (delicious) and Tanya had a Jack and Coke. We ordered an appetizer of stuffed mushrooms that came in a strange pottery dish consisting of six little wells, and a spoon. There was a thinly-crusted shrimp curled on the top of each well. Under that, crushed crab. Under that, spinach, and under that a brown mushroom. How very delicious! I want to find one of those dishes, it makes preparing stuffed mushrooms a neat and clean operation! We spent the whole day schmoozing and stitching. 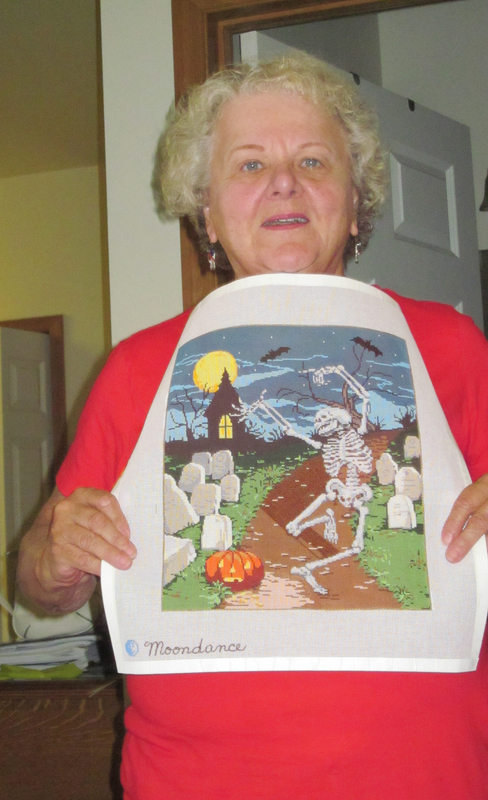 Last week I bought a new painted canvas which depicts a lively skeleton dancing merrily down a lane through a graveyard. It’s a macabre subject but the overall expression is joyous. It makes me smile. I got lots of compliments and some fine suggestions for working the piece. Got up in time to go to the 8 am service at St. James Cathedral, one of the oldest churches in Chicago, and just a few blocks from the hotel. The morning was cool, there were only a few people out walking their dogs – saw a Scottie! – and among the skyscrapers were a few homes, elegant stone Victorians and a few still-private residences. The service was in a tiny chapel in the undercroft dedicated to St. Andrew. The priest was a little young Spanish woman enveloped in her vestments, still excited at being a priest but not as smooth an operator as she will be in years to come. After, an old man, the church’s oldest member, took me up into the main church for a brief tour. The church’s bell tower actually survived the Great Chicago Fire. It’s had a number of makeovers and restorations over the years. To me, the oddest feature were the hammer-beam supports across the ceiling in the Romanesque church. There is a Tiffany window – very pretty, but actually painted rather than stained glass. The choir had been moved from the platform before the altar to one side and a high wood wall was placed in front of it. No one now can remember why, and they are raising funds to put it back. The pipe organ has pipes all over the church, including some long silver trumpets at the back. The west window is very modern and ugly. And in the narthex (the lobby) there is a Victorian angel in a window with two right hands. It’s in three sections and when it was installed the workmen accidentally flipped the middle section, where her arms are, so she appears to have two right hands. There are apparently no fund raisers planned to correct the mistake. The book signing went extremely well. We sold every single copy of The Drowning Spool the bookstore brought, plus all the copies of some other titles. I forgot to bring bookmarks. I absolutely loved talking to the women who stopped for an autographed book. Then I went over to the exhibit. These are stitched pieces members of ANG send in to be judged. Photographs were not allowed, which is a great pity as words alone are not remotely sufficient to describe some of these pieces. Blown away, that’s a reaction. So is Wow, and Oh. My. God. BUT the winners were shown at the banquet that evening and Tanya took some photographs there. One piece I really liked didn’t win, which is too bad. It’s a stocking featuring an old fashioned steam locomotive coming toward the viewer, the cowcatcher is beaded, a Santa is the engineer waving out the window, and she did something remarkable with the huge cloud of smoke that fills the top of the piece, many shades of black, gray and white. Another piece, that did win, was “God’s Oldest Angel”, a copy of a painting, done in tiny tent stitch by an eccentric man I got to meet while he sold tickets for the silent auction. I was nervous about the banquet that evening. My talk is normally about an hour long, and I was told not to go more than twenty minutes. I had gotten out my standard speech and gone through it slashing and burning until it got short enough. And they loved it, even the part where two pages stuck together and I found myself having to stop while I frantically looked for the missing page. I got a standing ovation at the end, my very first. And the chicken meal was delicious. Monday we stayed to hear a luncheon lecture with slides by a woman who was a curator of fabrics at the Victoria and Albert Museum in London and is now at the Metropolitan Museum of Art in New York. I didn’t realize there were beautiful survivors from the eighteenth century – three court dresses with ridiculous panniers, flat in front but stuck so far out at the sides the women looked as if they were standing behind a couch. Gorgeously embroidered with lots of real silver at the bottom, they weighed over ten pounds. And men’s suits with cutaway coats, also hand embroidered up the front and at the bottom of the sleeves. Tanya drove most of the way home, since I drove us there, and we ran into a vicious thunderstorm that hammered us in a road repair zone. Whoo! We stopped twice at Cracker Barrel Restaurants, where I bought an autumn-themed sweatshirt at one and some pottery bowls with a rooster in the bottom at the other – my set of four pottery bowls I use for salads each have a big chip around the top. Got home a little after midnight, exhausted but content.